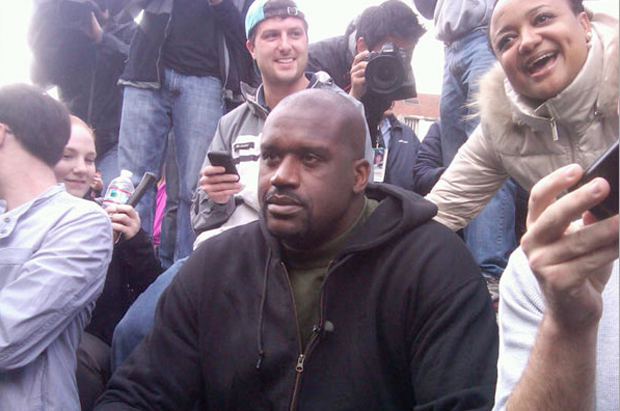 Shaquille O’Neal posed as a statue in Harvard Square for almost an hour last week, mobbed by adoring fans. How did it all begin? With a simple tweet. Shaquille O’Neal posed as a statue in Harvard Square for almost an hour last week, mobbed by adoring fans amazed the basketball superstar would pull such a stunt. Soon, the news went viral, shooting across the blogosphere and landing on ESPN, Yahoo, and in The Boston Globe. How did it all begin? With a simple tweet. The stunt was part of a project called “Random Acts of Shaqness,” developed in partnership with social media strategy firm Digital Royalty. Started in 2009, the Phoenix-based company has made an art of going viral, working with sports teams and brands such as Double Tree, the UFC, and the Cleveland Cavaliers. For example, to promote a UFC match, president Dana White and Digital Royalty decided to tweet his phone number to some 4 million followers on Twitter, asking fans to give their picks on that event’s winners. Soon, the cell was ringing off the hook with rabid fans from around the country eager to talk shop with White. Or for the Indianapolis Pacers, Digital Royalty sent out messages to fans offering free tickets to the first to arrive at a certain location. Within three minutes, more than 70 people showed up. Or for the LA Kings, the company implemented a “Hashtag Battle,” where fans of LA and the Colorado Avalanche could tweet #GoKings or #GoAvs during the game in a online hockey showdown. The teams donated $1 for each hashtag tweeted to Children’s Hospital Los Angeles. By the game’s end, the NHL had raised over $43,000. “It’s all about providing value,” says Martin, “to entertain, to provide information, to provide value when, where, and how fans want to receive it.” Though various social media platforms from Twitter to Facebook are inherently non-exlusive, the trick is to make them feel like exclusive clubs, where fans have direct access to news, deals, or insight from brands or celebrities. The value is obvious for fans–but is it actually valuable to engage them through social media? For the UFC, Martin says, measuring social media chatter helps predict Pay-Per-View orders. For other sports, tweeting and putting videos on YouTube may act as a “tipping point” for potential ticket sales. And Shaq? For now, it appears Martin’s strategy and knack for going viral is paying off. One day last week, for instance, 9 of the 10 worldwide trending topics on Twitter were all clients of Digital Royalty.